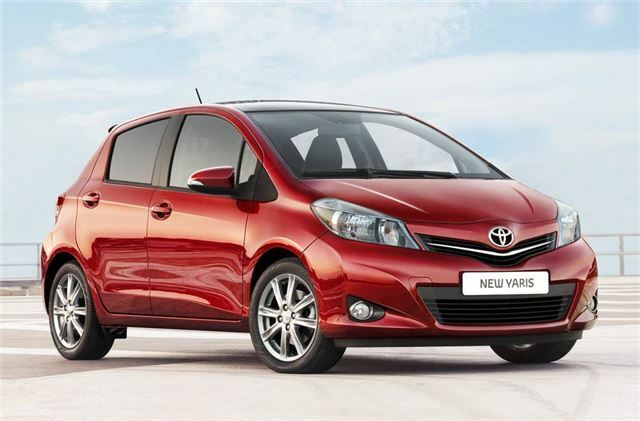 Toyota has announced pricing and specification details for its all-new Yaris which is now available to order. Prices start at a very competitive £11,170 for the 1.0-litre T2 three-door model rising to £15,385 for the top 1.33-litre T Spirit five-door with the Multidrive S CVT automatic gearbox. In terms of look, the new Yaris has a similar front end look to that of the Verso S plus it's far more angular than the outgoing model. This is the third generation Yaris and Toyota says it offers a step-up in quality, greater agility plus a breakthrough in affordable multimedia thanks to Toyota's Touch and Go system. The Touch system includes touchscreen controls and is fitted as standard to all but the entry level new Yaris model in the UK, providing Bluetooth, a USB port and a rear parking camera. It can be upgraded to the Toyota Touch and Go system which provides full map satellite navigation and access to a range of information services that can be accessed and downloaded via a dedicated Toyota customer portal. The new Yaris continues with the same engines that were in the previous model: 1.0-litre and 1.33-litre petrol units and a 1.4-litre D-4D diesel. All benefit from Toyota Optimal Drive, a range of engineering and design technologies which, combined with weight-saving measures and aerodynamics improvements, help cut fuel consumption and emissions without harming power and torque levels. The three-cylinder 1.0-litre VVT-i petrol is mated to a five-speed manual transmission and the latest version of the 998cc unit generates 68bhp at 6000rpm and maximum torque of 93Nm at 3600rpm. Fuel consumption has been improved to an estimated 58.9mpg while CO2 emissions are down to 111g/km. The 1.33-litre Dual VVT-i engine is also light and compact, with a small bore and long stroke to give a very high power-to-weight ratio. It generates 98bhp at 6000rpm and 125Nm at 4000rpm. When matched to the new Multidrive S transmission, fuel economy is an estimated 56.5mpg and CO2 emissions are 118g/km. Multidrive S is Toyota’s latest continuously variable transmission (CVT) which has a manual override with sequential seven-step mode that the driver can operate using either the gear lever or paddle shifts on the steering wheel. The 1.4-litre D-4D engine is fitted as standard with a diesel particulate filter (DPF) and is matched to a six-speed manual transmission. It produces 89bhp at 3800rpm and maximum torque of 205Nm between 1800 and 2800rpm. The estimated average fuel economy is an impressive 72.4mpg withemissions of 104g/km. The SR, available exclusively with the 1.33-litre Dual VVT-i petrol engine, has a sportier profile. Equipment highlights include 16-inch alloy wheels, a rear roof spoiler, front fog lamps, part-leather upholstery, rear privacy glass and lowered suspension. The T Spirit trim focuses on premium features and is available in five-door bodystyle with the 1.33- litre Dual VVT-i petrol engine. Principal equipment of the T Spirit grade includes a panoramic glass roof, dual-zone climate control, automatic headlights and windscreen wipers, auto-dimming rear view mirror and smart entry and start. On-the-road prices for new Yaris start at £11,170. Insurance groups will be announced in August. Cars are available to order now, with first deliveries to customers from mid-September.